Did Donald Trump’s predecessors congratulate Vladimir Putin’s election win? 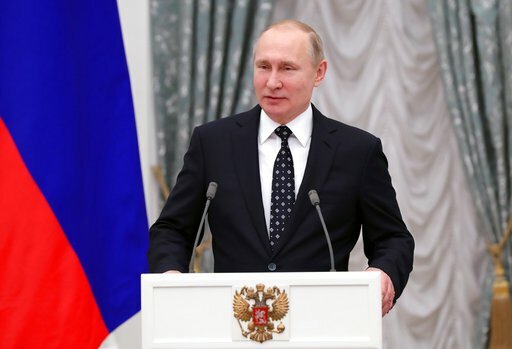 By John Kruzel on Wednesday, March 21st, 2018 at 11:31 a.m.
Russian President Vladimir Putin speaks at the Kremlin in Moscow, March 20, 2018. (Mikhail Klimentyev, Sputnik, Kremlin Pool Photo via AP). President Donald Trump has taken heat for congratulating Vladimir Putin following his successful bid in Russia’s presidential election, which critics have derided as a sham contest. International observers said the election was marred by the suppression of dissenting voices, and presented Russian voters with virtually no alternative options to Putin. The nonpartisan pro-democracy group Freedom House said the balloting amounted to a mock election of a dictator. As questions about the legitimacy of Putin’s victory swirled, Sen. John McCain, R-Ariz., who chairs the Senate Armed Services Committee, said Trump’s outreach was beneath the office of the presidency. "An American president does not lead the Free World by congratulating dictators on winning sham elections," McCain said in a March 20 statement. "And by doing so with Vladimir Putin, President Trump insulted every Russian citizen who was denied the right to vote in a free and fair election to determine their country's future, including the countless Russian patriots who have risked so much to protest and resist Putin's regime." Trump’s outreach comes as Special Counsel Robert Mueller and multiple congressional committees investigate Russia’s interference in the 2016 U.S. presidential election, as well as ties between Trump’s campaign and Moscow. Trump took to Twitter to defend himself by pointing out that his predecessor, President Barack Obama, had also congratulated Putin after his successful presidential run. "I called President Putin of Russia to congratulate him on his election victory (in past, Obama called him also)," Trump tweeted March 21. Trump’s defenders also drew attention to Obama's outreach to Putin following his win. "Media so dishonest," tweeted conservative pundit Laura Ingraham, who linked to a March 2012 Weekly Standard article, which noted that Obama phoned Putin from Air Force One to extend his congratulations. An archive of the the Obama White House website shows Obama did in fact talk with Putin on March 9, 2012, following his election win. "President Obama called Russian President-elect and Prime Minister Putin to congratulate him on his recent victory in the Russian Presidential election," according to the official summary, or "readout" of the call. International observers had also raised doubts about the legitimacy of Putin’s 2012 win. Obama’s own State Department, while congratulatory, noted concerns about "the conditions under which the campaign was conducted, the partisan use of government resources and procedural irregularities on election day." In 2008, President George W. Bush called Dmitry Medvedev following his successful presidential bid. But one account of their phone call said Bush "appeared to stop short of offering the customary White House congratulations to the president-elect." Some commentators pushed back on the notion that Trump’s outreach is akin to that of his predecessors, noting Russia’s meddling in the 2016 U.S. election. "2012: Obama congratulates Putin on his ‘win’. R’s attack. D’s silent," tweeted Ana Navarro. "2016-2018: Putin complicit in Assad’s genocide. Putin meddles in US elections. Putin poisons opponents in Eng. 2018: Trump congratulates Putin on his ‘win’. D’s attack. Most R’s -not McCain- crickets." 2012: Obama congratulates Putin on his “win”. R’s attack. D’s silent. 2016-2018: Putin complicit in Assad’s genocide. Putin meddles in US elections. Putin poisons opponents in Eng. This story has been updated following a tweet from President Donald Trump. "MEDIA SO DISHONEST: (Flashback) Obama Calls to Congratulate Putin"
"I called President Putin of Russia to congratulate him on his election victory (in past, Obama called him also)."